Alice and Bob are participants in an economy. Alice has a dollar. Alice gives the dollar to Bob. In Second Life terms, that’s a user-to-user transaction. Bob gives the dollar back to Alice. That’s another user-to-user transaction. Repeat this sequence four more times. Is Alice and Bob’s economy now worth ten dollars? Or is it still worth one dollar? Linden Lab will tell you that’s ten dollars. In reality, though, it depends on why Alice and Bob keep handing that dollar back and forth. You see economic activity isn’t the movement of money. Economic activity is the trade in goods and services, not money. Money is just one of the tools that are used to value goods and services. If Alice and Bob are just passing money to each-other without an exchange of goods and services, the economic activity – by definition – is zero, whether there’s one dollar or a thousand dollars, and whether it’s just Alice and Bob, or hundreds or thousands of other people involved. The movement of money is one method by which we can see economic activity happening, but doesn’t constitute economic activity itself, just as we can determine the approximate size and movement of ducks on a pond by watching the ripples – but the ripples aren’t the ducks. In any economy money moves between people, between accounts and between businesses for many reasons that do not constitute economic activity. Also, the exchange of goods and services for no money at all still constitutes economic activity of a non-zero value. Alice and Bob might be exchanging goods or services, in which case there’s economic activity accompanying that dollar in their inefficient little economy. If so, then yes, Alice and Bob’s economy is worth ten dollars. If not, then their economy isn’t worth ten dollars, or even one dollar. It’s zero, because no economic activity accompanies the exchange. Economics understands this, and when measuring the economies of nations, considerable effort is spent to separate out the movements of money which are not accompanying economic activity from those which are. Granted, for any economy much larger than Alice and Bob’s it requires a lot of estimation and educated guesswork to get even remotely close to the truth, but the practices are well-established (even though they undergo continuous improvement). 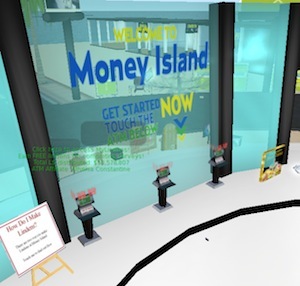 For virtual environments, though, centuries of economic thought and learning are discarded, and the focus is incorrectly placed solely on the movements of money. Small wonder that the operators of many virtual environments really seem to have no idea which direction their economies are actually heading in. I am constantly amazed by the fact we never hear from the big name economists/professors in SL about “The Economy” and we know who I refer to.